The winding road to Hana is one of the most well-known things to do in Hawaii. However, one thing needs to be made clear: Hana is not the goal. The best part of the road to Hana is the journey, not the destination. 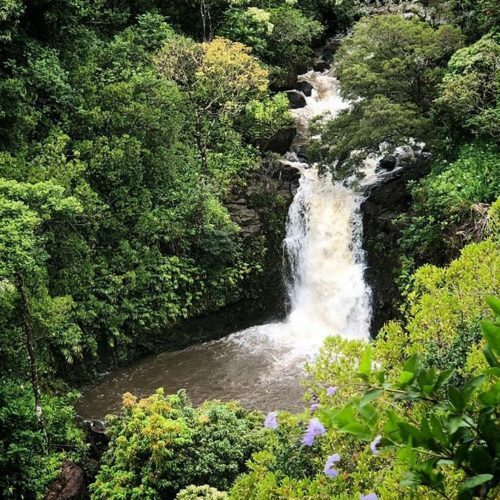 On the way to the tiny, sleepy city of Hana, you’ll come across several waterfalls, an arboretum filled with plants native to Hawaii, a beach peninsula, a lava tunnel, a black sand beach, and a fantastic banana bread joint. What more could you ask for? *Note: Before you head out on the road to Hana, be sure to fill up gas in the town of Paia! It’s the last gas station before you start your exciting adventure! This stunning oceanfront mountain range on the island of Kauai is VERY difficult to get to. Your options: boat, helicopter, or an 11-mile hike called the Kalalau Trail. If you are a very active person, the Kalalau trail might be the option for you. If not, a Na Pali Coast snorkeling tour or helicopter tour might be better suited for you. *Note: the Kalalau Trail is currently closed due to flooding. Hawaii is one of the only places in the world where you can swim with dolphins in the wild. They can enjoy their beautiful natural home, and you can watch them enjoy it! Dolphins love hanging out on the west side of Oahu, and their favorite spots on Kauai are the Na Pali Coast and Kauapea Beach. On the Big Island, they enjoy the Makako Bay, Kealakekua Bay, and Honaunau Bay. If you’re on Maui, Molokai, or Lanai, the dolphins like to hang out in the Auau Channel, which is the body of water in between the three islands. (I actually saw a pod of dolphins on a normal ferry ride from Lanai to Maui once.) On Lanai specifically, dolphins are commonly spotted at Hulopoe Bay. Waimea Canyon on Kauai is often compared to the Grand Canyon in Arizona. Most people go in expecting to see the same thing – I mean, how different can a canyon be? Waimea Canyon boasts a contrast of the red canyon rock to the bright green Hawaii plants that the Grand Canyon simply cannot compete with. 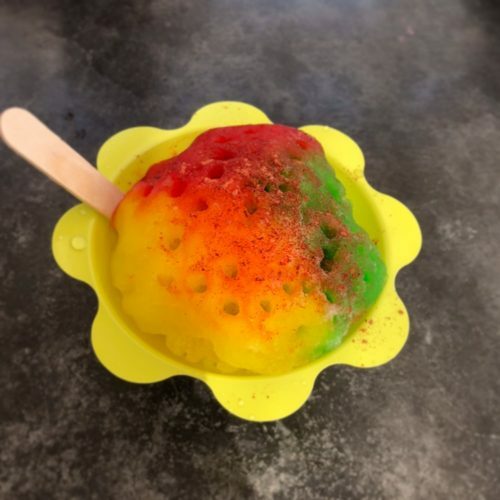 I’ve been asked before, “what makes one shave ice better than another shave ice?” The answer is simple: fresh, real flavors and a smooth ice texture. Which shave ice encapsulates that? Ululani’s on Maui. Currently, across all of the Hawaiian Islands, there is only one active volcano: Kilauea in Hawaii Volcanoes National Park on the Big Island of Hawaii. That means, if you’re going to have any chance of getting a glimpse of lava, you’ll have to go there. While some risky adventurers attempt to hike to see the lava, that sounds like a lot of work with a questionable amount of reward. I mean, what if the lava is flowing two miles away from where you expected it to be? That’s a lot more extra walking. Instead, there are both boat tours and helicopter tours that can get you to safely get a glimpse of this glowing hot lava from Kilauea. To the native Hawaiians, hula served as a way to remember their history, tell their stories, and keep their culture blossoming. When English missionaries came to Hawaii, they actually tried to suppress hula. But this valuable, culturally-rich tradition managed to pull through and is still practiced today. As a matter of fact, there are many hula competitions across the Hawaiian Islands. Easily the most famous hula festival is the Merrie Monarch Hula Festival held annually in Hilo on the Big Island. However, there are also other hula festivals, including the Prince Lot Hula Festival and Na Hula Festival on Oahu, the Hula Arts at Kilauea Series in Kona on the Big Island, and the Molokai Ka Hula Piko Festival on Molokai. Akaka Falls is a 442-foot waterfall! Can you even imagine that?! And before you even get there, you can get a glimpse of the 100-foot Kahuna Falls. So two stunning waterfalls in one trip. I highly recommend. The Lanikai Pillbox Hike might be my favorite hike. It’s not an absurd amount of effort, and you reach the best view I’ve ever gotten on a hike. Imagine the Pacific Ocean, changing from a light teal color to a dark blue the farther you look from shore. Then add two green island dots to make a picture-perfect view. Sounds like something you’re interested in doing? 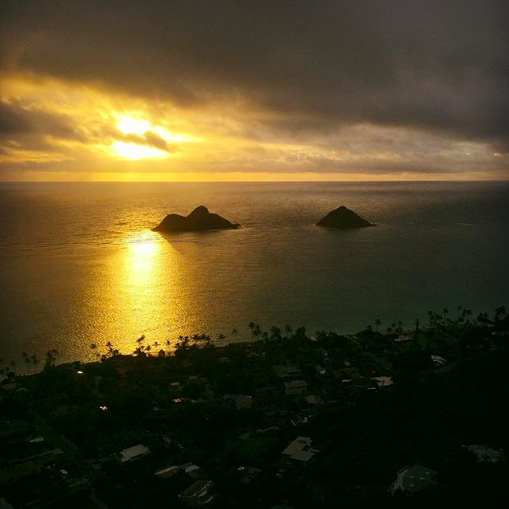 Here’s everything you need to know about doing the Lanikai Pillbox Hike. The Garden of the Gods on Lanai is one of the most magical places that I have ever been to. With no sound except the whistling wind, it was as if we had been transported to another planet! If you’re interested, here’s a guide to the Garden of the Gods! Thinking about spending more time on this small, secluded island? Here is the Ultimate Guide to Lanai! Hop on your mule for a ride down from the world’s highest sea cliffs on the Kalaupapa Trail! This spectacular view begins at 1,700, and you and your mule will get a stunning view of the Molokai coastline the whole time! *Note: the Kalaupapa Trail is temporarily closed due to a mudslide. Most people have never heard of the Hawaiian Island of Niihau, as it is actually privately owned by one native family. However, they do offer one way for tourists to visit the island. From Kauai, you can book a half a day helicopter tour. I have never been there, and I haven’t been able to find much information about the tour itself. But I mean, you’d be going to an island that the vast majority of people haven’t even heard of! The sunrise from Maui’s highest peak is absolutely stunning. Pinks, oranges, yellows, and even blues and purples paint the morning sky. But getting to the summit on time can be a bit difficult if you don’t plan it right. 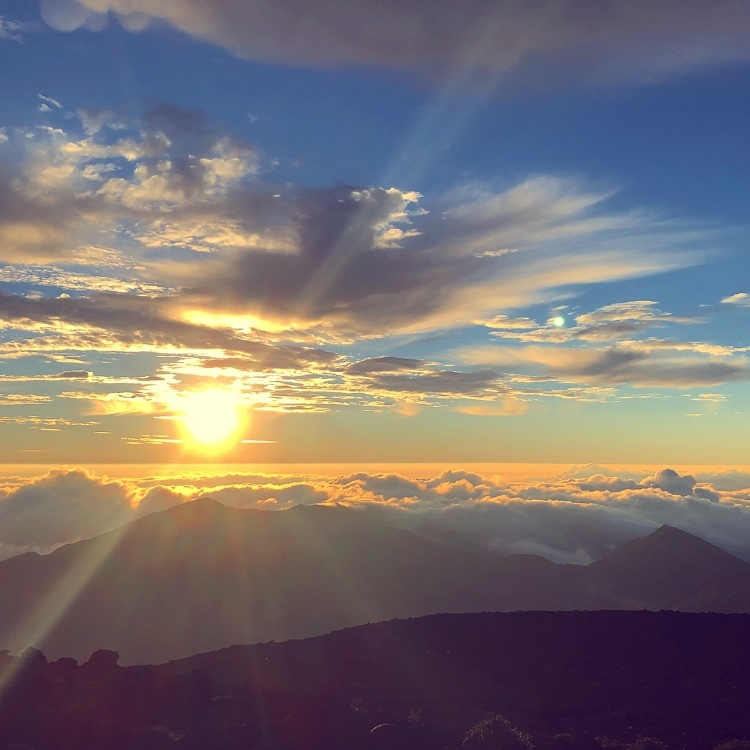 Here’s everything you need to know to catch the Haleakala sunrise. Across the Hawaiian Islands, there are quite a few black sand beaches. Basically, these black sand beaches come to be when the black lava rock is eroded down to become tiny black rock pieces (a.k.a. black sand). If you’re hoping to see a black sand beach, your best bet is on the Big Island. Check out the popular Punaluu Beach, the beautiful Kaimu Beach Park, or the newly created (you know, by the recent eruptions) Pohoiki Beach. (There are also quite a few more on the Big Island, but that’s just too many to list.) On Maui, there is Honokalani Beach in Waianapanapa State Park. Lastly, on Kauai, there is Waimea Beach. That’s right. Hawaii also has a green sand beach for you to visit. Papakolea Green Sand Beach located on the Big Island of Hawaii boasts this green sand beach of green crystals known as olivine (which also came from the volcanoes’ lava). We’re not done with the colorful beaches just yet. Kaihalulu Beach on Maui is a RED sand beach. Just as a warning, getting to the Kaihalulu Beach is quite difficult, and, consequently, many visitors end up injuring themselves. For this reason, visiting Kaihalulu Beach is sometimes illegal (the law changes rather frequently), so be sure to do your research before trying to get to the elusive red sand beach. 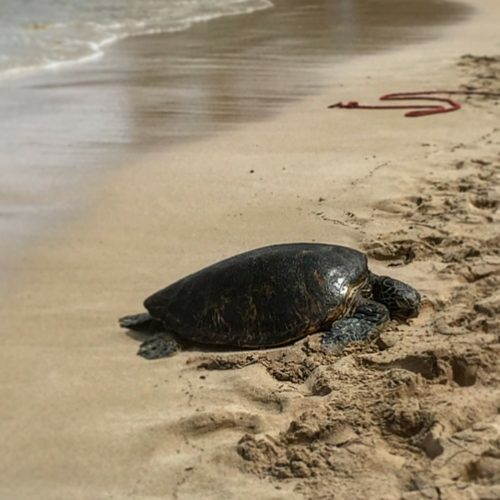 I’ve already written extensively on where to find turtles on Oahu, including Laniakea Beach, Makaha Beach, and the secret lagoon at Ko Olina. On Maui, these majestic sea creatures can be found at Keawakapu Beach, Ulua Beach, and Maluaka Beach. On the Big Island, Honaunau Bay and Punaluu Black Sand Beach are both pretty solid options. 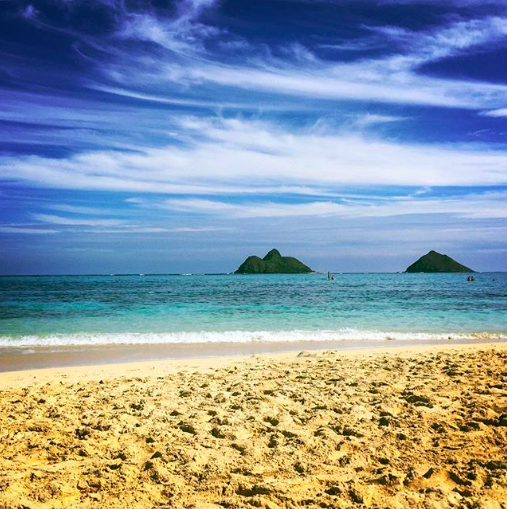 As for Kauai, Brennecke’s Beach and Lawai Beach are you best bets. On Molokai, between 9 and 10 a.m., turtles reportedly flock to Kalokoeli Fishpond for breakfast. Lastly, on the little island of Lanai, your best bet is Shipwreck Beach, but make sure you do not go into the water here, as the current is very strong! A lava tube is pretty much what it sounds like: a tube (usually made out of hardened lava rock) that lava from a volcano once flowed through. Pretty cool, right? And guess what?! You can visit one (or two or three)! By far, the most popular and well-known lava tube is the Thurston Lava Tube on the Big Island. This is one of the only lava tubes that you can easily walk through. There is also a lava tube on Maui in Waianapanapa State Park at the black sand beach. On Kauai, there are several on the Na Pali Coast. On Oahu, there is a hidden one at Cockroach Bay. Finally, rumor has it that just off the coast of Lanai, there are lava tubes underwater – which is a perfect adventure for some scuba divers. Many locals today host luaus of their own with all the traditional dishes, including kalua pig, poi, and poke. While it may be difficult to get an invite to a luau hosted by locals, there are many other luau options, including ones that are hosted by hotels. On Oahu, the most popular luaus are the Paradise Cove Luau and Germaine’s Luau. Maui is famous for the Old Lahaina Luau. 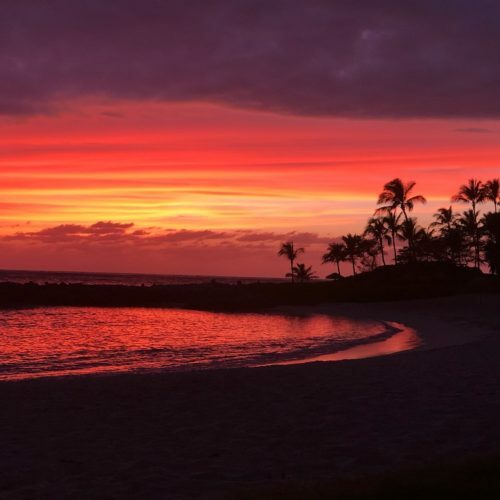 On the Big Island, the Legends of Hawaii Luau at the Hilton Waikoloa Village and the Mauna Kea Luau at the Mauna Kea Beach Hotel go head to head. Kauai’s Luau Kalamaku and Smith Family Garden Luau are also too close to call. Time and time again, I’ve said that the best place to watch the sunset in Hawaii is at the Ko Olina Lagoons. From the angle to the colors, it’s got it all. And here’s more of my reasoning for that claim. Thinking about spending more time at this beautiful set of lagoons? Here is the Ultimate Guide to the Ko Olina Lagoons! The entire island of Kauai is known for its amazing waterfalls. As a matter of fact, if you go to Kauai, I think you should just spend your entire trip just waterfall hunting, because they are so gorgeous! If I had to pick my favorite waterfall on Kauai, I’d have to go with Wailua Falls. This waterfall is sometimes 200 feet tall! And if you visit in the morning, it might have a wonderful rainbow glow around it. Banzai Pipeline on the North Shore of Oahu is the place to go to watch surfers. Throughout the winter months when waves reach 20 feet (or 40 feet for anyone who’s not local – we measure wave size differently), there’s probably going to be a surf competition happening. Check out Da Hui Backdoor Shootout, Eddie Aikau Big Wave Invitational, or Billabong Pipe Masters. Want to spend more time on the North Shore? I have an Ultimate Guide for that beautiful span of land too! Petroglyphs were the Native Hawaiians’ pictorial form of writing. Think of them as like the hieroglyphics of the Native Hawaiian people. The best place to see petroglyphs is on the Big Island of Hawaii, as many of these images have been carved into lava rock. Check out the Waikoloa Petroglyph Preserve, Puako Petroglyph Park, or the Puuloa Petroglyphs. On Oahu, there is only one consistent place to see petroglyphs, which is in the Nuuanu Memorial Park & Mortuary on the way to Kaena Falls. On Kauai, they can be found on the Mahaulepu Trail and in the Heiau of Lydgate Park. Maui has Petroglyph Hill at Olowalu Valley. Lastly, Lanai has a Petroglyph Field near Shipwreck Beach that is quite difficult to find. SNOW IN HAWAII? Yes, it’s a real thing! Drive up to the top of Hawaii’s tallest mountain (fun fact: it’s a dormant volcano!) to see it! 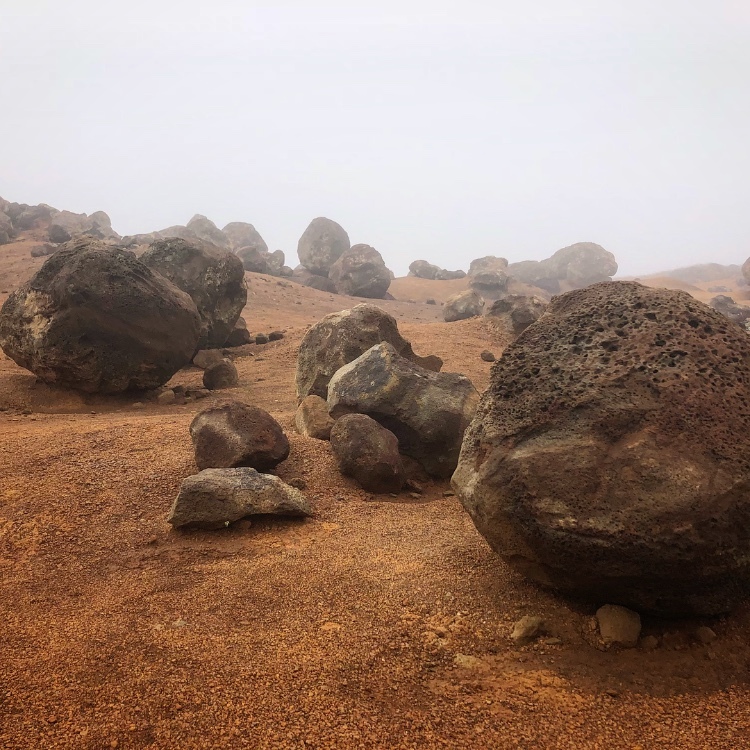 If you would like to reach the summit of Mauna Kea, it is recommended that you have a four-wheel drive (due to the lack of paved road) and that everyone in the car should be over 13 years old (due to the quick and extreme change in altitude). *Pro Tip: If you go around sunset and stay into the evening, Mauna Kea is an AMAZING place to stargaze. One of the most stunning sights in the world can only be seen from one of Oahu’s highways. Typically, on H-3, you drive through the plant-laden Koolau Mountain Range, which is already stunning. But then, when it rains hard enough, each and every crevice in the mountains (and there are many) becomes a waterfall. How amazing is that! 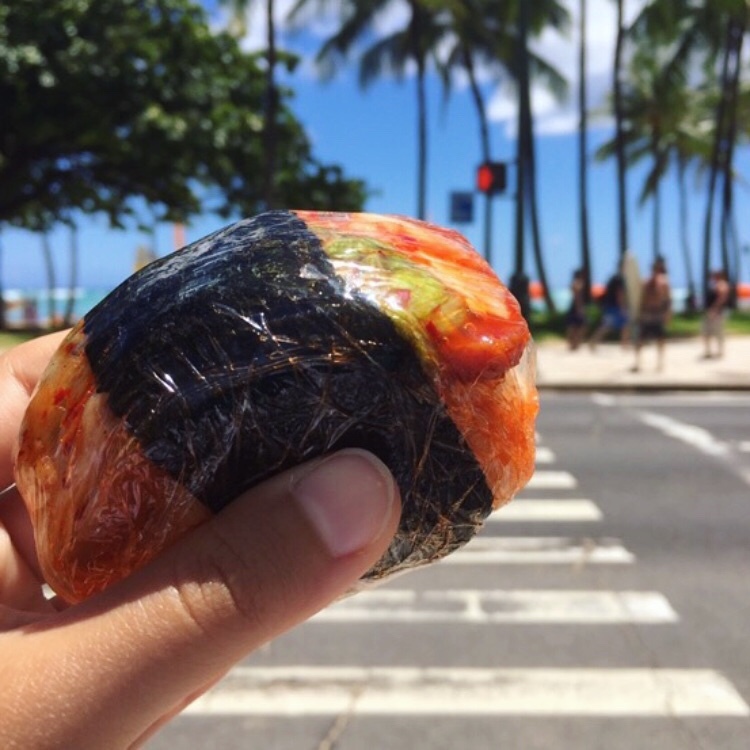 Eating a spam musubi should definitely be on your list of things to do in Hawaii. After all, it was the inspiration behind the Hawaii Food Bucket List. This rectangle of rice topped with a slice of spam and wrapped in seaweed is a local treat that is surprisingly delicious! Many boats that have been too old to continue have been purposely sunk to create a new reef for the Pacific Ocean’s sea creatues. That means that there are quite a few places to dive and see a shipwreck across the Hawaiian Islands. There is the Mahi Shipwreck on the west side of Oahu, the St. Anthony Shipwreck off Keawakapu Beach on Maui, the Lukemback Shipwreck on the east side of Kauai, two steamboats and one Hawaiian sampan at Mahukona Harbor on the Big Island, and a boat called the Naked Lady at the Big Island’s Kailua Harbor. *Note: While there are several shipwrecks on the north side of Lanai, this is due to the very strong currents and dangerous conditions. Therefore, it is not recommended that anyone scuba dive there, regardless of experience. Malasadas are Hawaii’s replacement for the typical American donut. For a long time, Hawaii was severely lacking on donut joints. But we always had the puffy, fried, sugar-coated rounds of deliciousness. 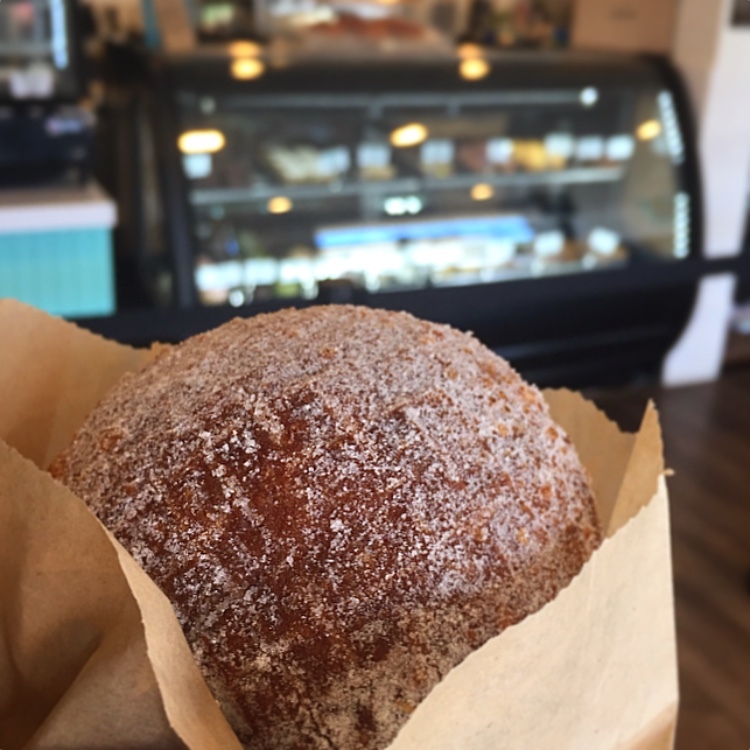 The place to get malasadas on Oahu is either Leonard’s Bakery or Pipeline Bakeshop and Creamery. (See the pros and cons here.) On Maui, head to Sugar Beach Bake Shop. As for the Big Island, rumor has it the place to go is Tex Drive In. The smallest of the eight main Hawaiian islands is actually a small 45-square-mile island known as Kahoolawe. This island actually has no permanent residents and was used as a training ground and bombing range during World War II. Unfortunately, this period of bombing was very harmful to the island. To this day, there are still bomb fragments that can be found. Even worse, there is hardly any plant life! If you would like to help restore Kahoolawe to its natural beauty that was once on par with the rest of the Hawaiian Islands, you can volunteer to do so! While there are quite a few amazing places to snorkel across the Hawaiian Islands, Molokini is one of the most unique. This crescent-shaped island just off the coast of Maui safely harbors many species of fish within its curve, meaning that there will be a lot for you to see! Not too long ago, I wrote an entire post on Lanikai Beach, the Oahu beach that has been voted as the best in the world. Relax on the soft white sand or swim in the picturesque turquoise waters! Yes, there is a 35-foot waterslide in the middle of the Big Island forest. Are you up for trying to find it? *Note: many reports have made it clear that trying to find this secret waterslide is not wise. The path to get there requires following an unclear path, navigating on the side of a very steep cliff, and even marching through a tunnel filled with water. On Oahu, there is an elusive, yet breathtaking secret location called the Mermaid Cave. See if you can find it! The Hawaiian Islands are a visually stunning set of islands, so why not see them from a bird’s eye view? From up above in a helicopter, you’ll be able to see the stunning blue ocean crash onto the golden sand before it turns into bold green mountains. If you’re on the Big Island, you could even catch glimpses of lava rock, desert, volcanoes, and lava! Can you imagine kayaking on a river for five hours to end up at a waterfall that is only accessible by kayak? That’s what it’d be like to kayak to Sacred Falls on Kauai. Plus, the Wailua River that you will be paddling on is considered to be one of the most sacred places in Hawaii. Sounds like a pretty awesome experience, right? 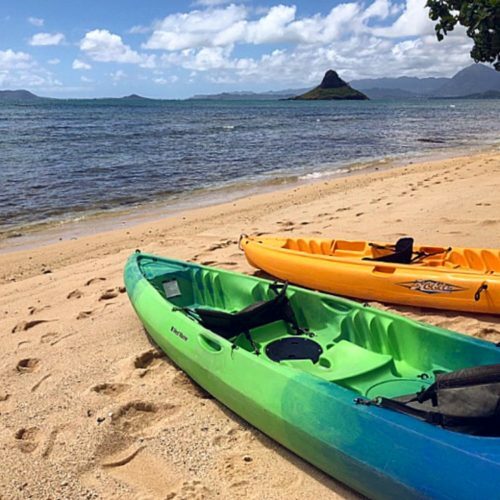 Rent a paddle board or kayak and make your way to Chinaman’s Hat, the little island just off of the east coast of Oahu. Then, after that upper body workout, make your way to the top of the island for some breathtaking views of the Koolau Mountain Range and the Pacific Ocean. If this sounds like one of your must-do things to do in Hawaii, here is a detailed guide to getting to and hiking up Chinaman’s Hat. The Kilauea Volcano is constantly emitting heat – although not necessarily through lava. This volcano also emits heat through steam vents! And you can actually access these steam vents and warm your hands up, because it can be quite chilly at such a high altitude. *Note: it smells like rotten eggs at these steam vents because of the sulfur that is being released. The Queen’s Bath is a unique tidepool located in Princeville, Kauai. This rather large, picturesque tidepool is perfect for floating around in, looking for fish, and even spotting a sea urchin or two! *Note: do not go to the Queen’s Bath during high tide, as this is VERY dangerous! The waves here have been known to sweep unsuspecting visitors off the rocks. So before you go, make sure that the tide is very low! We all love riding in a pool floatie down a lazy river. Now, imagine doing that on rivers, canals, and tunnels in the middle of a greenery-filled forest on the island of Kauai. Where else can you do something like that? Besides its beaches, everyone knows Hawaii for one thing: coffee. That’s why one thing you must do in Hawaii is tour a coffee farm. While Kona Coffee is the most popular out of all of the island, my personal favorite coffee visitor center is actually at the Kauai Coffee Company. With half of dozen different coffee flavors hot and ready to try, a stacked gift shop, and a peaceful walk around the coffee bean trees, there’s something for everyone (even non-coffee lovers!) to do here. 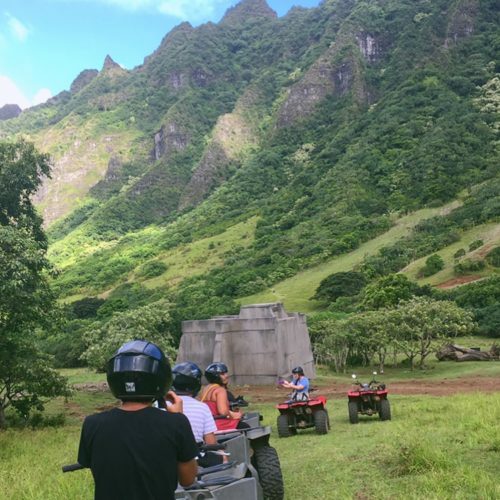 Kualoa Ranch is nestled within the luscious green Koolau Mountain Range on Oahu and is probably one of the most stunning places on the planet. Zoom around on an ATV to see as much of this stunning landscape as possible, while also munching on mountain apples and macadamia nuts and learning about Hawaiian myths. It’s a once-in-a-lifetime experience. A visit to the Pearl Harbor Memorial on Oahu will allow you to learn about and remember December 7, 1941. The most popular macadamia nut company in Hawaii (and maybe even the world) is Mauna Loa Macadamia Nuts. Take a couple of hours to visit their factory in Hilo on the Big Island, and you won’t be disappointed! Drive through three miles of macadamia nut trees, learn about the macadamia harvesting process, munch on some free samples, and perhaps even buy some to take home with you! This remote beach on the west side of Kauai is slowly becoming known as one of Hawaii’s most beautiful beaches. With stunning white sand and a backdrop of the famed Na Pali coast, it’s no wonder that Polihale State Park is so gorgeous. Hawaii has some pretty cool farmers’ markets. Not only do we have exotic fruits like rambutan, yellow dragon fruit, lilikoi (passion fruit), guava, and so much more readily available, but there are also locally grown treats like honey, meat, and flowers available for purchase at some of the largest farmers’ markets. On Oahu, the must-visit farmers market is the Kapiolani Community College Farmers’ Market. On the Big Island, it’s the Hilo Farmers’ Market. If you’re on Kauai, check out the Kauai Community College Farmers Market. On Maui, there’s the Upcountry Farmers’ Market. Or if you’re on the small island of Molokai, check out their ONLY farmers’ market on Ala Malama Street. Everyone knows the Dole Plantation for their pineapples and Dole Whips. Not long ago, because of the Dole Plantation, the Hawaiian Islands were covered in pineapple fields. If you want to get a glimpse of that today, head to the Dole Plantation on Oahu. While you’re there, try an authentic Dole Whip, wander through the world’s largest maze, take a train tour, and learn about different varieties of pineapple. First, I have to preface this recommendation by saying that this is not like the El Dorado of sea glass. You won’t come here and find the largest, most colorful pieces of perfect sea glass that you’ve ever seen. However, you WILL find a beach with tons of small sea glass pieces that seem to make the sand glitter, especially at sunset. 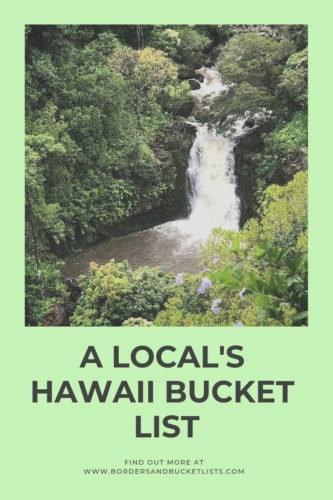 I’ve started to add a hike or beach clean-up to every list of things to do in Hawaii that I have on this website. Why? Not only do I think that this has the potential to be a fun, fulfilling experience, but I also think that if you spend so much time on your vacation enjoying this beautiful trash-free environment, why not help the islands stay that way? Just grab a trash bag (and perhaps some gloves) and pick up anything that doesn’t belong. Thank you for your help in advance! 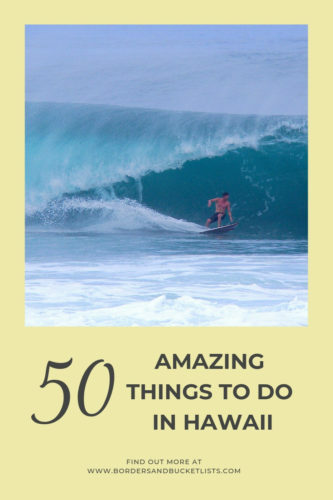 I’ve mentioned many things to do in Hawaii on all eight of the major Hawaiian Islands. Trying to figure out how to island hop between as many as possible? This island hopping guide should help you out! Looking for more things to do on the island of Oahu in particular? Here’s a list of 100 amazing activities! Planning a trip to Hawaii any time soon? Or maybe just dreaming about a future vacation to the islands? Pin this post for later! Make a trip over here happen! And when you do, I’ll have lots of tips for ya! Yay! 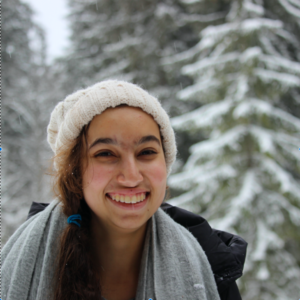 So glad I could give you some travel inspiration! Fanstastic list! Thank tigger sharing & always better coming from a local! Need to get back to experience more of Hawaii, clearly! So glad you are enjoying my local tips! I hope you get to put them into action with another trip over :). Great list! We lived on the Big Island for 4 years with the awesome opportunity to hike around Maui, Molokai, Oahu, and Kauai for a month on each island. We never made it to Lanai though! Inspiration for the future. A friend just went to Kauai last month and heard there is zero talk about opening the Kalalau Trail (happy we hiked it, though it was terrifying!). And yes, Tex Drive In did have the best malasadas when we lived there! Great post! Wow that sounds like such an amazing experience! I’d love to spend a month just hiking around all of the different islands! And what a bummer about the Kalalau Trail!! Hopefully talks will start happening soon! 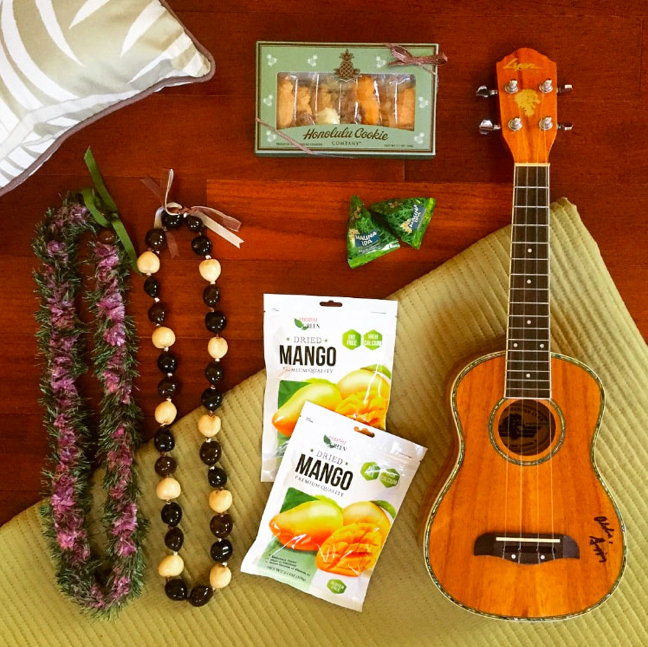 I’ve been researching and day-dreaming trips to Hawaii all day today – so glad I came across your post! I’ve seen the Stairway to Heaven all over the place and had no idea it was illegal, interesting! These ideas are so unique and ones I hadn’t considered, I’d love to make my own lei, what’s a better souvenir than that?! Haha so glad you enjoyed the post! There’s actually a ton of local Hawaii info on this blog, so, if you would like, you should do a little perusin’ :). And yeah, the Stairway to Heaven is illegal! I’m pretty sure that most tourists who attempt it have no clue that it is! Haha me too!! It’s one of my favorite things about Hawaii :). Hawaii has so many interesting things to do. You have compiled such a fantastic list of the top ones. Hawaiian shaved ice is awesome and seeing the volcanoes is so unique! Akala Falls Wallis falls sounds like something I would love to see. So glad you enjoyed the list! Hawaii really is such a unique place :). 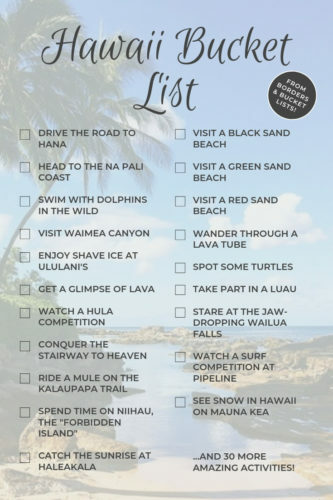 So many things to do in hawaii..good compilation.I would like to visit big island ,maui in hawaii.Thanks for sharing so detailed guide here and bookmarking it for reference. Those are two awesome islands! Glad you enjoyed the read! I’m so ready to visit Hawaii after reading this! It’s really a dream destination for me, and I’m longing to visit. Akaka Falls is stunning, and I want to see a turtle too on the red sand beach. I truly hope to see this wonderful island one day soon. I’m a geology junkie so I love the diverse that Hawaii has to offer. From volcanoes, beaches, to even canyons — which I had no idea about, honestly! — there is so much to explore. I would definitely take some time to explore all these wonders. I’ve never seen a green sand beach either, so I would really enjoy that. Haha yeah, Hawaii’s got it all! If you love different types of landscapes, the Big Island should definitely be your first stop, because they have rainforests to volcanoes to snow-covered mountain tops to deserts to beaches. It’s literally almost every type of landscape you could imagine! And then Kauai should be second on the list for Waimea Canyon :). Haha always glad to share Hawaii trip inspiration! It was honestly so hard to narrow it down to the best of the best! I’m thinking about doing a list of things to do on all of the islands! So far, I only have Oahu done, but here’s the post if you want to check it out! Wow! I had no idea you could see snow in Hawaii! I thought it would be too hot for that. Yeah! It’s actually always quite warm at sea level, but Mauna Kea is nearly 14,000 feet high!! Hawaii is so amazing and i did not know there was so much to do other than chilling at beach. I would love to explore atleast half of those things whenever I get there. Lovely guide. Haha yeah there is WAY more than just going to the beach! You just have to do a tad more research to find out about them :). I have only been on a cruise to Hawaii and explored different islands. While I enjoyed my cruise this reminds that I should fly over to Hawaii and explore the different islands. 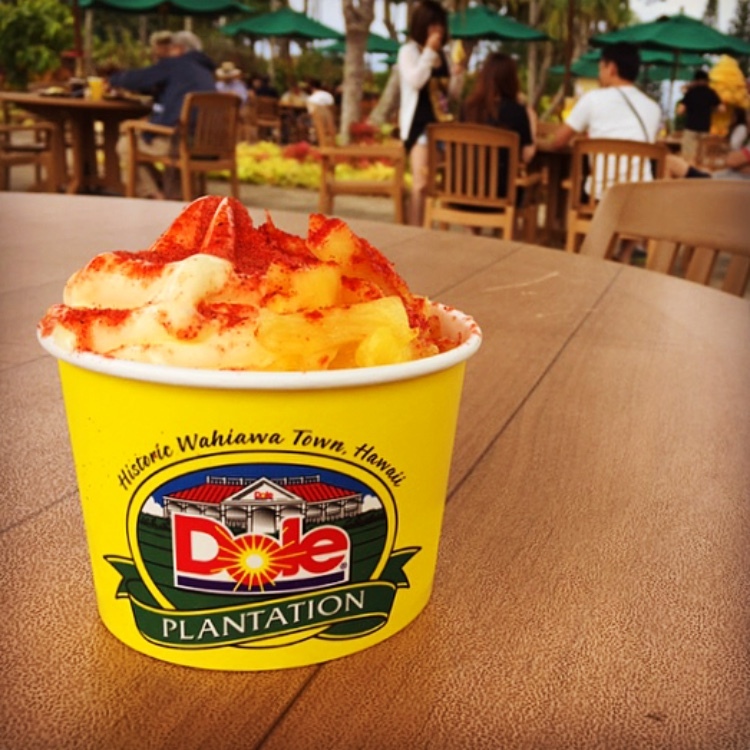 I would def go to the dole plantation for yummy treats. I also will be looking for the mermaid cave. For sure! There is so much more to do on each island than you can cover in just one day!